Fortunately, there has been a plethora of behind-the-scenes tell-all books in the past couple of decades, from rock star memoirs (as if we’re supposed to believe our childhood rock heroes can really remember much of anything!) to books by groupies, session musicians, tour managers, agents and others who were there. Most exciting to me, there are books by producers and engineers about many of the major recording sessions that yielded the music that, to this day, we love so much. Well, I, for as long as I can remember, have been an avid reader and a music lover. As a fan and as a musician, I’ve always been a back-stage kind of guy. Even as a kid, as far back as the late 1950’s and the early 60’s I’d been interested in what went on behind the scenes, whether it was in the wings of the stage, the dressing rooms, the limos and hotels, or in the recording studios. I wanted to know what musicians thought about, how it all felt, how a song first saw light and then developed and unfolded, and how the music was created, arranged, recorded and ultimately presented live. 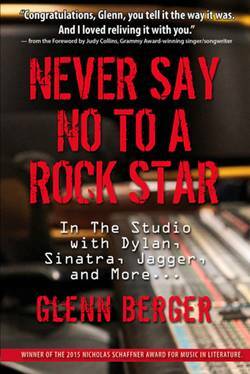 Well, I have found the mother lode of them all: it’s called "Never Say No to a Rock Star: In the Studio with Dylan, Jagger, Sinatra and More" and it’s the memoirs of one-time recording engineer Glenn Berger. And, at its core, it’s a book about saying “Yes” – yes to his direct employers, yes to the artist he was serving, and most of all – Yes to himself. First, a little about this book; then we’ll speak with the author and get even more in-depth about some of what he has experienced and shared. Not only are the stories he relates interesting and even somewhat scandalous (and definitely juicy), there’s a special insight and humanity in this book that makes it a joy to read. I found the writing to be so descriptive and excitingly detailed that I felt like I was actually there in the studio while I was reading. 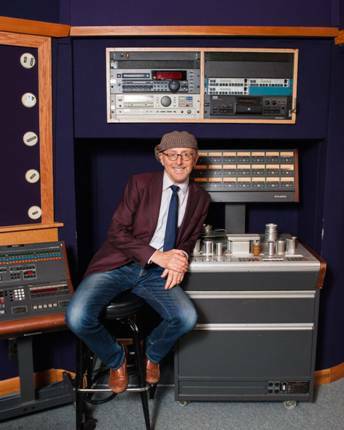 The author describes the first time he walked into the hallowed Studio A-1 of A&R Studios – the iconic New York City recording company where he found employment under the tutelage of world-class engineer, then producer, Phil Ramone. The huge main room, formerly the primary recording facility of Columbia Records, was the scene of iconic recording sessions by artists such as Bob Dylan, Frank Sinatra, Barbra Streisand, Paul Simon, Miles Davis, and scores of other musical greats. I could imagine – and almost feel - that the great room was virtually humming with its own musical energy, viz: "The room gave off a sweet ring like a bunch of monks chanting "om," as the author describes the sensation of first walking through the doors into the chamber. Berger offers that in his current life he is a psychotherapist in New York City. The good doctor becomes motivated to rev up his time machine and travel back to the year 1972 following an especially moving professional encounter with a patient who tries to get in touch with his feelings by bringing in and playing Aretha Franklin’s record, “Bridge Over Troubled Water.” The recording evokes strong emotions in both patient and doctor, the result being that our hero is sensually transported back to his early days in the music business as a tape operator, a “schlepper” (as he describes it) and eventually an assistant engineer, then full engineer, to the great Phil Ramone. And, of course, he takes us with him on this wonderful ride. "The catharsis felt good, but troubling. I knew my emotion was about something more than Aretha's soul-healing performance," he tells the reader. His feelings beg to be explored from the more objective perspectives of time away, of a grown man – and of a professional mind-explorer, no less. We’re treated to a front row seat in the roller coaster, gripping the handle bar with the author as Berger relates tales of painstaking recording sessions, unhinged egos, all-night sessions often aided by … chemicals … and deep, if often confusing, soul-provoking. About those who exhibit true musical greatness, he conjectures: " ...all wisdom traditions tell us that we find our greatest fulfillment by surrendering to something bigger than ourselves. It comes from using our will to become willing. It comes from learning how to say yes to life and what it demands of us at each moment ..."
What we’re treated to is hardly all philosophy. The scandalous fun is to hear Glenn’s first-hand accounts of some of the attitudes and temper tantrums by artists such as Bob Dylan, who counts off a brand new song he just demonstrated, then purposely throws all of his newly hired studio musicians off guard by changing songs, keys, tempos and changes over and over until they can no longer follow him. Then he summarily fires them, one at a time, as they demonstrate that they can’t keep up with his mystifying musical whims. The author tells of the painstaking and meticulous work that the studio staff puts into a Paul Simon “live” album, which is ultimately so comped, faked and edited that it is finally anything but “live,” and how Simon thanklessly pushes them for more and more and better and better without acknowledgement or appreciation. He also shares a story of Simon mercilessly eviscerating the anorexic Karen Carpenter during her first attempt at recording solo. Berger relates an exciting story of A&R being hired by The Rolling Stones to mix and edit a recording from their 1973 European tour for the syndicated King Biscuit Flower Hour radio program. Glenn’s “co-producer” in this venture turns out to be none other than Mick Jagger himself, whom the author describes as the consummate gentleman and professional. Watching Jagger overdub the lead vocal onto this live version of “Honky Tonk Women” the singer dedicates his one-to-one performance to the author. Saying, “This one’s for you, Gin-gah!” (Glenn has red hair, and “Ginger” was Mick Jagger’s pet name for him.) Berger has the opportunity to discuss Jagger’s fairly recent (at the time) movie, “Performance,” and suggests to the singer: “it's like genius is the freedom to say yes to yourself, and that requires a lack of self-consciousness. If you looked in the mirror, that is, if you become self-aware, it was gone." Mick heartily concurred with “Ginger’s” astute assessment of the motivation of his movie character. Even at that young age the one-day Doctor Berger offered up some pretty uncommon insight. There are many, many more wonderful stories including some about recording sessions with James Brown, Wilson Picket, Paul Shaffer, Judy Collins, Phoebe Snow, the making of Dylan’s “Blood on the Tracks” (I don’t know if the title was intended as such, but I now see it as referring to the “blood” Dylan drew, spilling on the tape machine’s 16 recording tracks), Bob Fosse’s movie “All That Jazz,” The New York Dolls, Frank Sinatra and many more to make the book very difficult to put down in order to get a good night’s sleep. I had the pleasure of speaking with Glenn Berger at his home base outside of New York, from my own in the northern outskirts of Philadelphia, after a couple of week’s fun and enthusiastic communication by email. "Never Say No to a Rock Star" was just released this past July 1st by Schaffner Press, Inc., and is already meeting with readers’ enthusiastic reactions. Robert Z Rush: Glenn, you went from being a busy and well-respected recording engineer who started out, as you describe it, as a 17-year-old “schlepper for Phil Ramone” to your current career as a Psychotherapist? RZR: Then, tell me, Dr. Berger – what motivated you to leave the music business when you were so successful? GB: [laughing] Well, I eventually became disenchanted with the music business, and when that happened I didn’t want to hang on too long. When it went from musicians in recording studios to one guy in a room with a laptop a lot of the luster came off it. Then, I became so involved with my new pursuit that, eventually, I didn’t give my past much thought. RZR: You describe in your book the session with a patient who brought in an Aretha Franklin recording he found moved him, with the hope that it would help him get in touch with his feelings to express to you. Yet, you found that it touched you equally. And that was your motivation to explore the feelings you suddenly felt about your past? GB: Yes. That was about eight years ago. [Regarding the music of the 60’s and 70’s]: The music back then was Life, itself. Everyone was just waiting to hear the new thing. The great artists were pursuing things that were theirs and following their vision, not just trying to write the next “Sergeant Pepper.” Magical things happened because it wasn’t computerized. There were these accidents – these fortuitous moments [that got captured on tape]. You can hear the sound just getting big as they fall in to the pocket! We were listening for “feel” more than almost anything else. The best recordings were cut live, but the last of the big rooms are closing now. The smells and the familiarity and the realness is gone these days [in current recordings]. RZR: Besides “never saying no” to the artists, how did you learn to not overreact to huge stars you were working with, especially starting out at such a young and impressionable age? GB: I learned I had to be invisible. I had to be cool. I had to remember I was hired to do a job. It really took a toll on me, holding all that [emotion] in. The ones [in the business] who could do that were the ones who survived. Eventually, it became who you are. RZR: Did you find yourself falling into the trap of inflating your own self-worth because of your proximity to, and working relationships with, the superstars? GB: Sure. I became a prick. It was part of the shtick. We were trained to be that way. I definitely got very lost, as so many people do. But, something inside me told me to get away from this because it’s getting out of control. RZR: What initially interested you in getting into the music business? GB: As a young kid I heard “Land of 1,000 Dances” and decided I wanted to make records. When I listened to music I felt at one with the Universe. At age 14 or 15 I took some LSD and had a vision and I wanted to buy a tape recorder, so I got one and started playing with it. 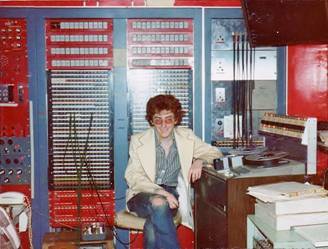 When I was 16 my mother got me an internship at a jingle house [a company that created commercial jingles], then at 17 I began working at A&R [Recording]. It was a classic internship where the student sat at the feet of the master, and the teachers valued the interns so they could move up. RZR: I’d imagine it took an awful lot of courage for a 17-year-old kid to apply for a job with a company as important as A&R was. GB: Well, my mother was a bit of a stage mother – she was a frustrated singer. She was a “stage door mom” who encouraged me with her indomitable spirit. She would tell me “Just go for it!” My grandfather – my mother’s father – was also a positive influence. He was in his 70’s and living in an old age home in Coney Island when he had a renaissance. He started writing philosophical essays and discussions. His example led me to do this crazy thing and get my first book published at 60! Deep down, this is a book about following your dreams and ambitions with persistence, perseverance and patience. It’s about growing up while keeping your ears and eyes alert to hear and observe the world around you. It’s also about delving deep inside to try to understand what it is you’ve seen, heard, learned, and ultimately, feel. Most of all, however, it’s a story of how music was made “back in the day.” It paints fascinating and colorful pictures of private, privileged, first-hand encounters with some of the greatest of the greats who created it and lived the life during one of the most exciting and musically adventurous times our generation has ever known. Glenn’s story is also cleverly and importantly punctuated by a side-story of his wife and himself as they strived to build a family, and the adoption of their children. Interestingly, many of the same lessons apply. "Never Say No to a Rock Star" is a provocative title that is part of the protocol and the philosophy of the world Glenn Berger describes, and I have to admit that the title sold me. However, after removing the bow, I was even more thrilled by what was revealed the more I unwrapped the package. If any of my description gives the impression that it’s more a book on philosophy than a book on the music business in the 70’s, let me assure you: There’s enough discussion of the music to satisfy even the biggest music geek, and the stories are spicy enough to please even the most profoundly inquisitive of us. There’s just enough technical talk to indulge any gear-head, and there’s more fervent chemical consumption than an episode of HBO’s “Vinyl.” At the same time, there’s enough depth and quality of information to satisfy the most demanding reader. This is some choice reading, my friends. "It comes from asking the question: What does the universe want from me now, rather than what do I want from the universe? "But whether there is a grand master plan, or if the only meaning in a meaningless world is the meaning we give to it, the answer is still the same. You can hear it in Keith [Richards]'s guitar. He plays it, holding nothing back, just so he can ring that cosmic bell again and again. Because this is his only chance in a very long eternity to do so. Because that's the way the universe sings." To celebrate my book release, I’m throwing a benefit party for MusiCares on September 29th at The Cutting Room (in New York City). 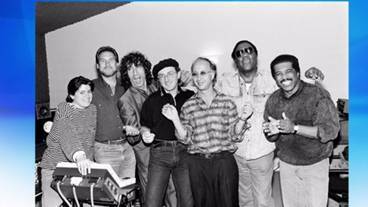 It’s going to be a reunion for all of us NY studio cats – the players, singers, producers, engineers, studio staffs, etc. (who are the true heroes of my book). 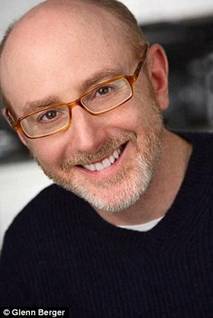 Robbie Kondor is going to be the Musical Director (recently MD for James Taylor and Carole King). It looks like we are getting some great, classic players and singers to participate who have played with everyone and been behind endless hit records (Terre Roche, Paul Shaffer, Lou Marini and the Nuff Brothers, The Mar-Tays, John Tropea and his band, Will Lee, Chris Parker, Jimmie Young, Bones Malone, Richard Frank, Frank Simms, Joe Cerisano, Joe Ward, many more). As this is a chance to hang with old friends, hear some great music and stories, and raise a few bucks for a good cause, I wanted to send you a personal invite to see if you can make it. I think it’ll be a lot of fun! I would be thrilled to see you! Spread the word! Tickets can be purchased at the link below. Let me know if you can make it!